Revving up at the Izzy Elves Section! What exciting times for us Izzy Elves! Deedy (that’s Dorothea Jensen to Some) has shown us a few of the sketches coming in for the two new Izzy Elves stories, Blizzy, the Worrywart Elf, and Dizzy, the Stowaway Elf. (Blizzy is my favorite girl elf, and Dizzy my best friend.) These pix are AWE! SOME! Blizzy looks so pretty in her story, and the poem shows how brilliant her brain is, too! Everybody else in the section kept thinking I was just enjoying my Christmas Day Off, but not Blizzy - she figured out where I was! Thank Goodness that Owen and Alex were able to get me home again in time for the Elf Celebration! That was a really, really close one. Dizzy is, well, Dizzy. He gets into some serious trouble, partly because of me, I’m afraid. But just as two little boys rescued me in Tizzy, the Christmas Shelf Elf, a smart little boy rescues Dizzy. Of course, to be honest, the same little boy and his brother are the ones who get Dizzy in trouble in the first place. (After me, that is.) How was Dizzy to know that Stuart and Drake would startle the reindeer into taking off with nobody driving Santa’s sleigh except....well, you’ll find out! 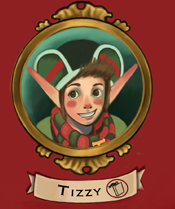 My friends are all thrilled that my own story, Tizzy, the Christmas Shelf Elf, is a Real Book now. I think they are a bit jealous, too. But I tell them that they will all have books of their own. Eventually. And Blizzy and Dizzy will have books by the beginning of October, in fact! Quizzy, Frizzy, Bizzy, Fizzy, and Whizzy will just have to be patient. Elves have a hard time being patient, but that’s just the way it is! And don’t forget that Deedy has made wonderful audiobooks of all three of the Izzy Elves stories that she has written down for us so far. I’ll be back to report soon! P.S. Don't forget that to learn more about all of us and our stories, check out Deedy's website at dorotheajensen.com!